How the media are organised and funded is central to understanding their role in society. Critical Political Economy of the Media provides a clear, comprehensive and insightful introduction to the political economic analysis of contemporary media. Jonathan Hardy undertakes a critical survey of political economy scholarship encompassing worldwide literature, issues and debates, and relationships with other academic approaches. He assesses different ways of making sense of media convergence and digitalisation, media power and influence, and transformations across communication markets. Many of the problems of the media that prompted critical political economy research remain salient, he argues, but the approach must continue to adapt to new conditions and challenges. Hardy advances the case for a revitalised critical media studies for the 21st century. Introducing key concepts and research, this book explains how political economy can assist students, researchers and citizens to investigate and address vital questions about the media today. "Jonathan Hardy’s book deals in a highly astute manner with the question: How are the media shaped by and shaping capitalism and power structures? It is an excellent resource for scholars, students, activists and citizens who are interested in the critique of the political economy of the media and who want to understand what informational capitalism is doing to us and how we can politically resist it." "Questions about the arrogance of media owners, the pervasiveness of advertising and public relations, the failure of regulation, and the pressures on public cultural institutions, are once again rising to the top of the agenda for debate. Jonathan Hardy’s timely intervention provides an admirably clear and accessible introduction to a tradition of inquiry, critical political economy, that has always placed these issues centre-stage. Anyone seriously interested in unpicking the ways media are shaped by the shifting play of power between corporations, governments and civil society will find this book an indispensable guide." "The critical study of the political economy of the media has never been more important. 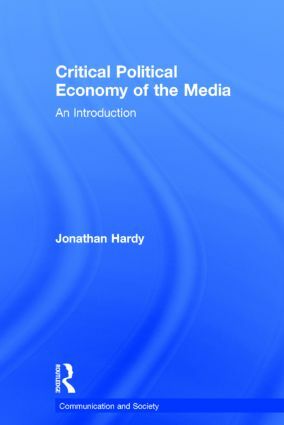 Jonathan Hardy provides an excellent overview of this vital perspective in a book that should become a key text in media and communication studies." Jonathan Hardy is Reader in Media Studies at the University of East London and teaches at Goldsmiths College, University of London. He is the author of Western Media Systems (2008) and Cross-Media Promotion (2010). This series encompasses the broad field of media and cultural studies. Its main concerns are the media and the public sphere: on whether the media empower or fail to empower popular forces in society; media organizations and public policy; political communication; and the role of media entertainment, ranging from potboilers and the human interest story to rock music and TV sport.